Wer möchte, kann sich aktuell das Spiel Homefront für seinen Windows-PC kostenlos sichern. Dazu geht Ihr einfach in den Humble Store und wählt dort das derzeit kostenlose Spiel aus. Ihr benötigt einen Account dort, welchen Ihr Euch ggf. kostenlos anlegen könnt, dieser wird dann mit Eurem Steam-Account verknüpft. Klickt Euch einfach durch und dann wird Euch eine E-Mail mit dem Steam Key zugesendet. Wer nicht auf die E-Mail warten will (dauert ca. 5-10 Minuten), kann sich auch direkt über den blauen Button (Preview) eine Vorschau der gesendeten E-Mail anschauen. Am Ende unter der Werbung findet Ihr dann den Product-Key (Button Redeem on Steam). Diesen einfach im Steam-Client über „+ Spiel hinzufügen“ und „Ein Produkt bei Steam aktivieren“ eingeben. Danach könnt Ihr das Spiel installieren uns nutzen. Die Aktion läuft noch bis morgen (09.12.2017). The year is 2027. The world as we know it is unraveling after fifteen years of economic meltdown and widespread global conflict over dwindling natural resources. A once proud America has fallen, her infrastructure shattered and military in disarray. Crippled by a devastating EMP strike, the USA is powerless to resist the ever expanding occupation of a savage, nuclear armed Greater Korean Republic. Abandoned by her former allies, the United States is a bleak landscape of walled towns and abandoned suburbs. This is a police state where high school stadiums have become detention centers, and shopping malls shelter armored attack vehicles. A once-free people are now prisoners… or collaborators… or revolutionaries. 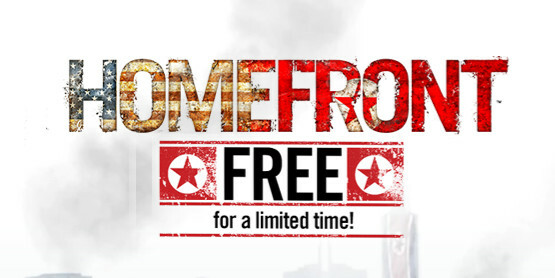 Join the Resistance, stand united and fight for freedom against an overwhelming military force in Homefront’s gripping single player campaign penned by John Milius (Apocalypse Now, Red Dawn). Stand alongside a cast of memorable characters as an emotional plot unfolds in this terrifyingly plausible near-future world. Experience visceral, cinematic first-person shooter action as you fight your way across Occupied USA using guerrilla tactics, and commandeer military vehicles and advanced drone technology to defeat the enemy. Multiplayer brings epic warfare to the online arena as infantry, tanks, attack helicopters and combat drones battle across huge, open battlefields. A rich feature set offering layers of tactical depth combined with a game-changing innovation in the multiplayer space will set a new benchmark in online warfare.